364 pages | 11 B/W Illus. 1. Nick Moschovakis, "Introduction: Dualistic Macbeth? Problematic Macbeth?" 2. Rebecca Lemon, "Sovereignty and Treason in Macbeth" 3. Jonathan Baldo, "‘A rooted sorrow’: Scotland’s Unusable Past" 4. Rebecca Ann Bach, "The ‘Peerless’ Macbeth: Friendship and Family in Macbeth" 5. Julie Barmazel, "The servant to defect: Macbeth, Impotence, and the Body Politic" 6. Abraham Stoll, "Macbeth’s Equivocal Conscience" 7. Lois Feuer, "Hired For Mischief: The Masterless Man in Macbeth" 8. Stephen Deng, "Healing Angels and ‘Golden Blood’: Money and Mystical Kingship in Macbeth" 9. Lisa Tomaszewski, "‘Throw physic to the dogs!’: Moral Physicians and Medical Malpractice in Macbeth" 10. Lynne Bruckner, "‘Let Grief Convert to Anger’: Authority and Affect in Macbeth" 11. Michael David Fox, "Like a Poor Player: Audience Emotional Response, Nonrepresentational Performance, and the Staging of Suffering In Macbeth" 12. James Wells, "‘To be thus is nothing’: Macbeth and the Trials of Dramatic Identity" 13. Laura Engel, "The Personating of Queens: Lady Macbeth, Sarah Siddons, and the Creation of Female Celebrity in the Late Eighteenth Century" 14. Stephen Buhler, "Politicizing Macbeth on U.S. Stages: Garson’s MacBird! and Greenland’s Jungle Rot" 15. Bi-qi Beatrice Lei, "Macbeth in Chinese Opera" 16. Kim Fedderson and J. Michael Richardson, "Macbeth: Recent Migrations of the Cinematic Brand" 17. Bruno Lessard, "Hypermedia Macbeth: Cognition and Performance" 18. 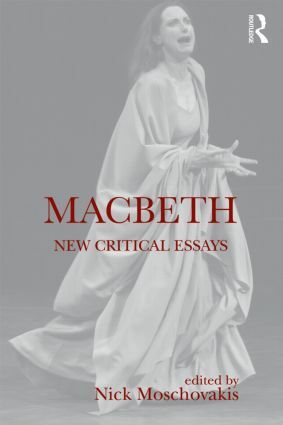 Pamela Mason, "Sunshine in Macbeth"
Nick Moschovakis has published essays in academic and cultural journals including Shakespeare Quarterly, Milton Quarterly, and College Literature. He has taught courses on Shakespeare and early modern English literature at The University of the South, George Washington University, Reed College, and elsewhere.